This Land Cruiser is ready to bask in the technicolor cityscape that is Miami. Coated in the sun-scorched shade of Pollux Orange and radiating all-weather toughness, this revitalized vintage ride is ready to bring the heat! The color of this Land Cruiser isn’t just orange, it’s Pollux Orange. And Pollux isn’t just one of the brightest stars in the sky (or the first name of a bonafide Toyota factory color), it’s a Greek demigod. So let’s just say this Land Cruiser has a lot to live up to. But greatness has always come easy for the Land Cruiser, with its simple “bend some metal around it” design philosophy. And here, those rugged good looks are served over hard (aka with a hardtop), contrasting black accents, and heavy rubber. This classic ride drives, sounds, and smells, just like a Land Cruiser should. Under the hood, you’ll find a completely rebuilt Toyota 2F engine, with those classic exhaust notes and legendary torque. A formidable companion, paired with a 5-speed transmission. Note: 5th gear equals coast-mode. Improved steering stability and a new suspension system further refine this rugged ride. 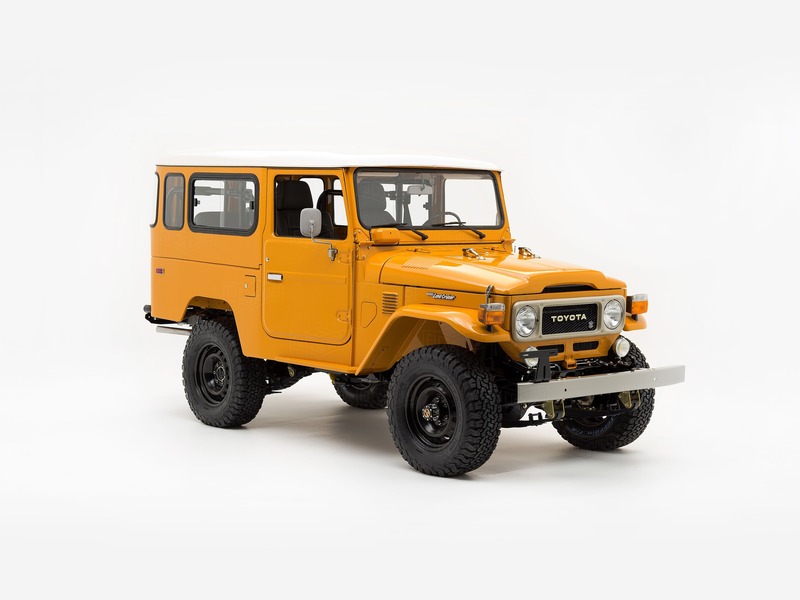 The interior cabin of this FJ43 was made to tame the Miami tropics. Here, marine-grade upholstery guards against sun damage and humidity, while the Vintage Air A/C keeps cool air flowing throughout the cabin. A custom rear beach keeps passengers facing forward for added safety, and folds down to make room for more cargo.